So much has happened in the last couple of weeks that I’m never going to fit it into one post. There’s the wedding day itself, the food, my thoughts and photos (which we’ll be getting at the beginning of October, I promise to share a few). There’s also two weeks’ worth of adventure on an island thousands of miles away, more photos and a catalogue of delicious meals consumed and new flavour combinations to experiment with. All of which means I’m starting back in this space with something very simple. Going to Bali was an incredible experience – the people, the scenery, the food, the flavours and that big ball of orange energy in the sky that just makes everything better. The only down side? Nearly twenty hours of travelling on cramped, air-conditioned planes and an eight hour time difference to confuse matters even further. Plane food is a pet hate of mine. If travelling short distances I tend to eat well before and after, ignoring what’s on offer in the air or packing just a few snacks. I had every intention of making some more substantial meals for Carnivorous Husband and I to take to Bali, but after 48 hours of wedding partying I simply didn’t have the energy to do it. Twenty hours of mushy vegetables, unidentifiable meat, cardboard rolls and endless offers of chocolate and crisps later, the pair of us made a pact never to eat plane food again. On our return journey we asked our hotel to make up a delicious picnic for our evening meal then braved it through without any more to eat until we walked through the door of our flat. Not entirely advisable but the contented feeling as we tucked into silky homemade scrambled eggs with leeks and spinach, smoked salmon and hot buttered toast was a million miles from the uncomfortable bloat of anything we’d have eaten on the airplane. Next time we’re travelling, I might just take some of these. 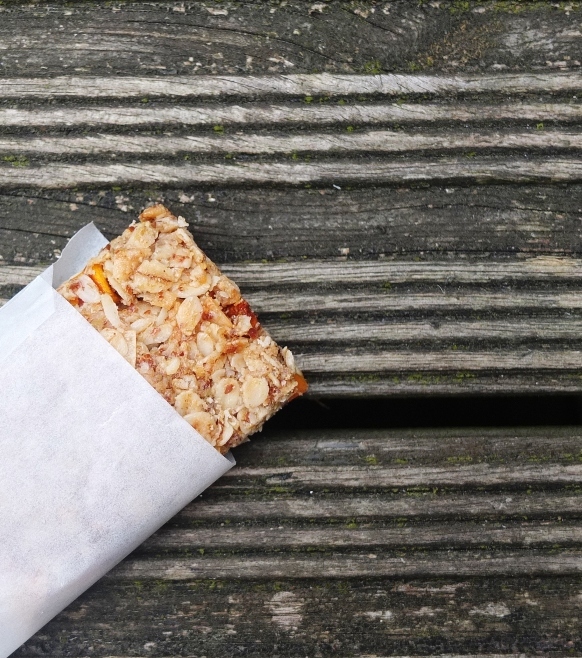 The kind of treat you can eat for breakfast, a mid-morning snack, afternoon tea or dress up for dessert, these anytime sunshine bars are the perfect jet-lag food and travel well. The ingredients are inspired by what we enjoyed fresh in Bali – mango and coconut – but you could substitute dates and raisins, dried apple, papaya or apricot and pretty much any kind of nut. Just try to find fruit that’s been dried without any additional sugar – it’s a little chewier but, I think, more delicious. Preheat the oven to 175 degrees C. Line a 20cm square tin with parchment paper. In a large bowl, combine all the ingredients thoroughly. Pour into the prepared tin, pack down the mixture with a spatula and bake for 25 – 30 minutes or until golden brown and firm to the touch. Cut into bars while still warm then allow to cool before serving. Perfect eaten any time, anywhere: preferably on a beach in Bali. Ooh that sounds like a delicious addition! Oooh yes cardamom! 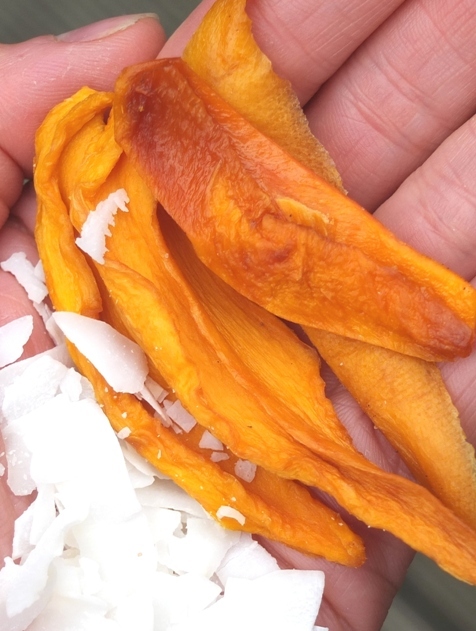 I’ve been eating dried mango like a crazy person, so I have everything on hand to make these. Having also just come back from Bali, I might be making some of these! I know what you mean about plane food – although the food itself isn’t necessarily that bad, I think it’s the experience of eating it in such a cramped and depressing space that makes it all taste the same and leave you feeling gross. Also, don’t feel too bad about the marathon journey to/from Bali – my plane home from Singapore got caught up in a bomb scare, meaning my journey home was nearly 48 hours (minus sleep, naturally)! Hope you had a great time and looking forward to hearing about Bali adventures – did you go to Ubud? Glad to see you back already! I’m impressed that you’re already back after a week of returning – and I’m excited to hear more about the wedding and honeymoon. And these bars look simple and great. Do they hold together? As in are they chewy-type bars or the crumbly soft kind? I’ll do some more wedding/honeymoon updates soon, promise! 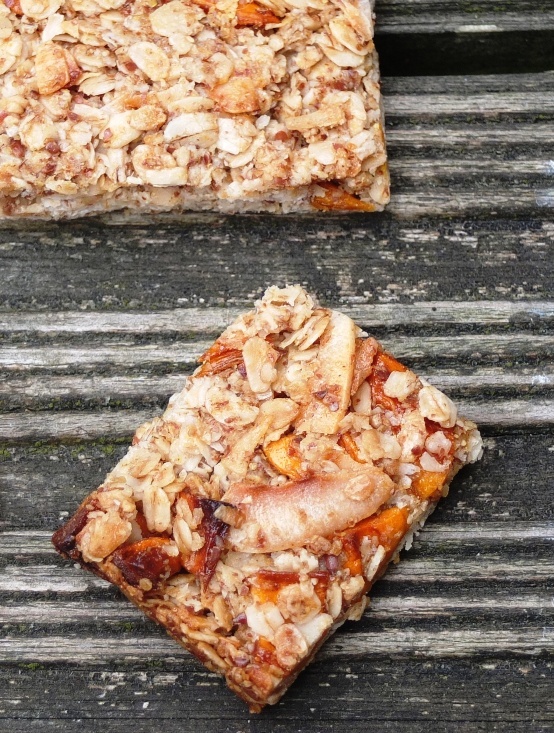 And these bars hold together really well – the chewy rather than crumbly kind, especially if you use natural mango which is chewier than it’s sugar-cured counterpart! We try to avoid airplane food too, they can be so depressing. These bars, on the other hand, are just the opposite! What gorgeous colours! These bars look delicious! The addition of dried mango is such a great idea. I don’t recall seeing brown rice syrup in the stores before, will have to keep an eye out for it next time. So envious of your honeymoon in Bali and now have a massive desire to find some excuse to go there (again), this could be hard as the 20 hour flight is a harsh reminder that it is a pretty long way from Blighty and my ‘little people’! 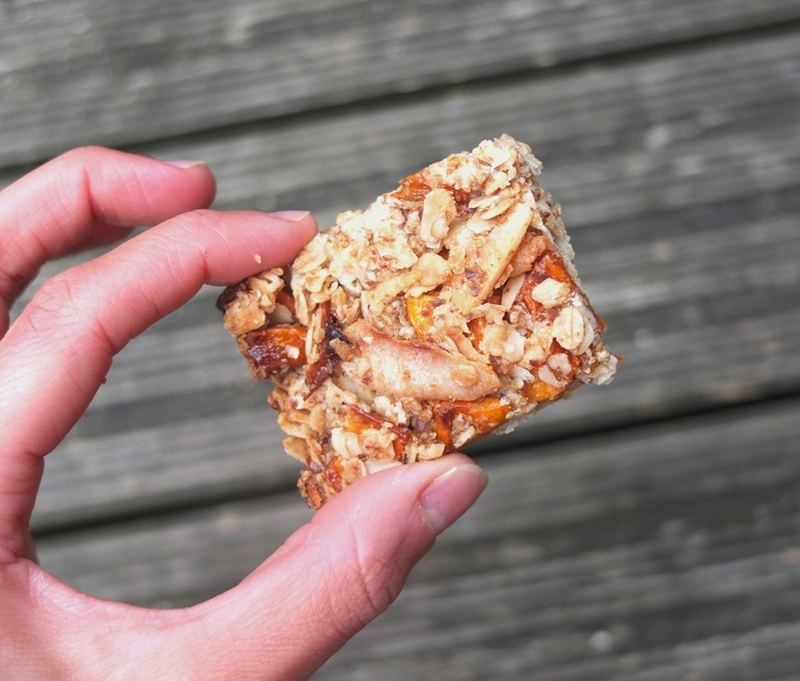 Totally get your point about gross airplane food and love the sunshine bars, do just check you can get them through UK security….. They are weirdly hot on baby food and I have no idea where they stand on something as delicious and homemade as this! I’ve managed to get food through security in the past…I think usually as long as you eat it before you arrive at the destination it’s ok. But good point to flag! I think airline food is generally awful but then I realised since having kids I have not been on a plane since my eldest was a baby. We travel twice a year to France by car but when we do eventually brave flying with them I will certainly be making these. A real treat that will be enjoyed by us all. I also have an unopened jar of coconut oil that needs using! I hardly eat on airplanes either, and arrive to wherever I’m going starving! these are indeed the perfect snack, so full of flavor and energy! Lovely bars Kate. I am totally with you – I always take a picnic with me on flights because the airplane food makes me feel terrible and really travel sick. Such a great idea to get the hotel to provide you with a picnic for the way home too! These little bars are perfect for that kind of trip, enough to keep you full and sated without feeling uncomfortable. Congratulations on your wedding! And Bali, I am dying to make it there some day! I’d love a cup of tea with some of these bars right about now.. The actual travel is always the worst isn’t it but it sounds like the destination was worth it! These bars look so delicious! A perfect any time treat! Long haul plane travel is such an endurance test. I’ve had some very dire food. On a flight in China we were expecting a meal to be served but instead we received a keyring; still not the most inedible meal I’ve been given. The only bearable plane food item: Biscoff Cookies. Even still, I would much prefer one of these bars. 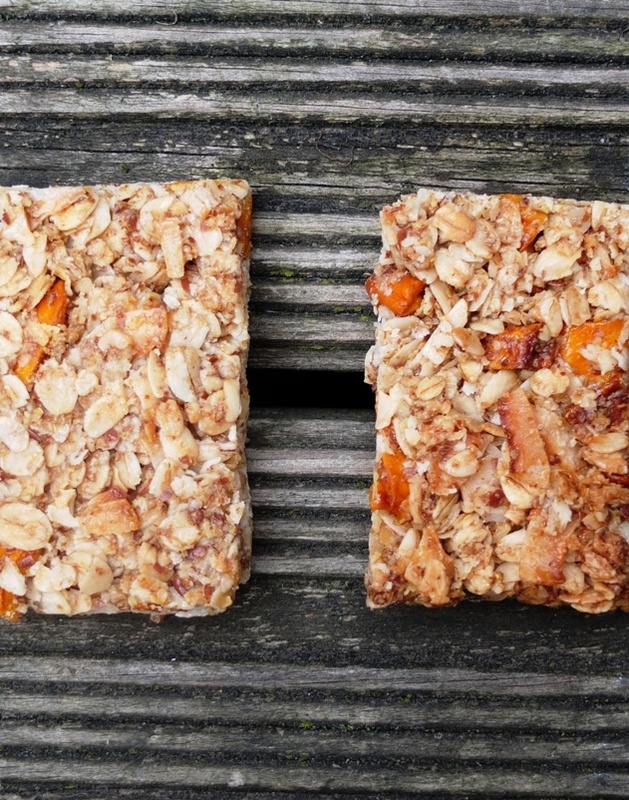 Chewy, fruity, and packed with oats—that’s just how I like them. Welcome back!! I totally agree about airplane food, I always swear that I will never eat plane food again but I always end up eating it and I always regret it. Love the tropical feel to these bars, we will be heading in to mango season soon so I will definitely be trying these. I don’t mind airplane food but tend to carry snacks like this for my girls as to date I have never managed to get them to eat anything on a plane. Not a bad thing as we hit the hotel buffet on arrival and they’re like pack animals feasting on prey! Hi, I thought these looked really tasty so had a go at making them yesterday but they just turned into a tray of crumble? Any suggestions? These look great, would be a good healthy snack for children. 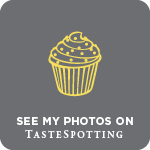 So glad I stumbled upon your blog! The “Anytime Sunshine Bars” sounds wonderful. I’m looking forward to making them soon.